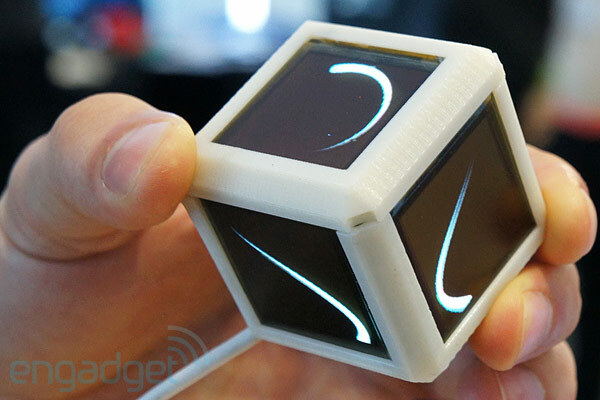 How do you develop an OLED display that gives a 360-degree perspective? Toss six 1.25-inch panels into a plastic cube, then turn it as you see fit. That’s an overly simplistic explanation for the six-sided display on hand at the MIT Media Lab today, which is quite limited in its current form, but could eventually serve an enormous variety of applications. Fluid Interfaces Group Research Assistant Pol Pla i Conesa presented several such scenarios for his Display Blocks, which consist of 128 x 128-pixel OLED panels. Take, for example, the 2004 film Crash, which tells interweaving stories that could be presented simultaneously with such a display — simply rotate the cube until you land on a narrative you’d like to follow, and the soundtrack will adjust to match. It could also go a long way when it comes to visualizing data, especially when in groups — instead of virtually constructing profiles of individuals who applied for a slot at MIT, for example, or segments of a business that need to be organized based on different parameters, you could have each assigned to a cube, which can be tossed into an accepted or rejected pile, and repositioned as necessary. Imagine having a group of display cubes when it comes time to plan the seating chart for a reception — each cube could represent one individual, with a color-coded background and a name or photo up top, with different descriptive elements on each side. The same could apply to products at monstrous companies like Samsung or Sony, where executives need to make planning decisions based on product performance, and could benefit greatly from having all of the necessary information for a single gadget listed around each cube. On a larger scale, the cubes could be used to replace walls and floors in a building — want to change the color of your wallpaper? Just push a new image to the display, and dedicate a portion of the wall for watching television, or displaying artwork. You could accomplish this with networked single-sided panels as well, but that wouldn’t be nearly as much fun. The Media Lab had a working prototype on display today, which demonstrated the size and basic functionality, but didn’t have an adjustable picture. Still, it’s easy to imagine the potential of such a device, if, of course, it ever becomes a reality. As always, you’ll find our hands-on demo just past the break. OLED Display Blocks pack six 128 x 128 panels, we go hands-on at MIT (video) originally appeared on Engadget on Tue, 24 Apr 2012 17:44:00 EDT. Please see our terms for use of feeds. After the most recent quarter Apple CFO Peter Oppenheimer was proud to let us all know that there are now 365 million iOS devices “in play,” with over 50 million sold just in Q2. With the iPhone now available in 100 countries on 230 carriers and the new iPad shipping in over 40 countries, the continued growth isn’t much of a surprise. Obviously, as the number of devices in the hands of users increases, so does the number of apps, and in this quarter the iTunes app store topped 600,000 apps — including over 200,000 specifically designed for the iPad. The iPad in particular was singled out as being a driver for growth. 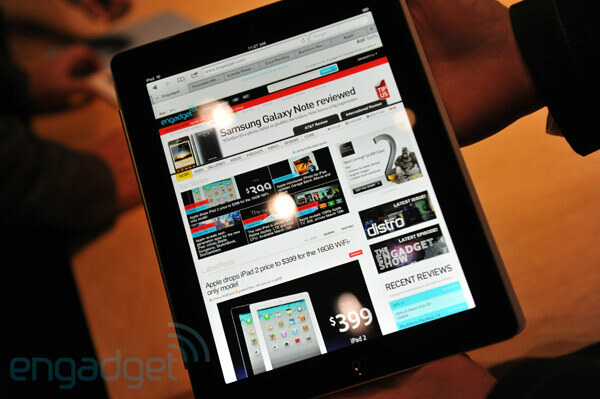 Tim Cook said that 67 million iPads have been sold since the first model debuted. By contrast, he claims it took 24 years to sell that many Macs. Oppenheimer said that the education market was increasingly turning to the tablet, purchasing them by a margin of almost two-to-one over Macs. The San Diego school district in particular ordered 10,000 this quarter and has plans to purchase 15,000 more. Even the government is getting in on the action, with the air force using them as flight guides. For more details from Cupertino’s earnings call check out our live blog. 365 million iOS devices ‘in play,’ iPad taking off in education and government markets originally appeared on Engadget on Tue, 24 Apr 2012 17:30:00 EDT. Please see our terms for use of feeds. It’s Tuesday, and while not our regular day, we’re going to let you listen into the recording booth when the Engadget HD podcast goes to mp3 at 6PM. Please be a part of it by reviewing the list of topics after the break, then participating in the live chat as you listen in. Join the Engadget HD Podcast live on Ustream at 6PM ET originally appeared on Engadget on Tue, 24 Apr 2012 17:19:00 EDT. Please see our terms for use of feeds. This entry was posted on April 24, 2012, 5:46 pm and is filed under Mobility. You can follow any responses to this entry through RSS 2.0. Both comments and pings are currently closed.